Josh Brock’s Redbud 400 day at Anderson Speedway was somewhat like being aboard the biggest roller coaster at the fair. 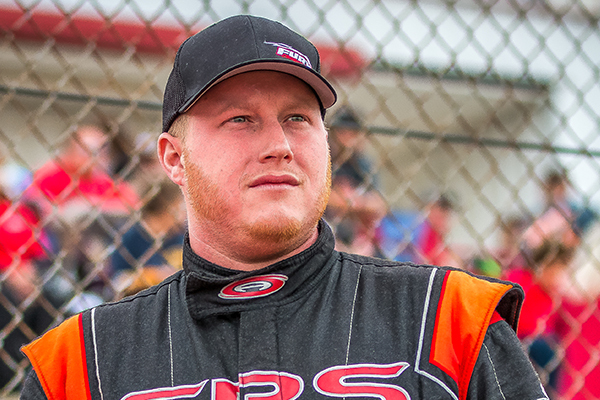 After battling back from two laps down, the Corbin, KY driver was in a position to battle for the lead on a late-race restart. On the race’s final turn, however, contact with another driver sent him into the wall and relegated him to a 14th-place finish. With qualifying cancelled due to weather, the field was set by practice times, putting Brock in the third position at the green flag. He was caught up in an early incident that forced repairs to his No. 17 Stream Restoration Specialists machine. After going down two laps early, the Josh Brock Racing team fought back and the No. 17 was in the top 10 again on lap 322. From there Brock continued his march to the front, breaking into the top-five with just over 25 laps to go and the top three on lap 386. Sitting third on a restart with five laps to go, Brock and Stephen Nasse raced hard for second position and swapped paint and tagged bumpers. The end result as the checkered flag waved ahead was Brock’s No. 17 slamming the turn four wall. After the race, tempers flared in the pits and there was a confrontation been members of the Brock and Nasse crews. Brock now looks to put the Redbud 400 in his rearview mirror and concentrate on his number one goal for the 2018 season, to win an ARCA/CRA Super Series Championship. He currently leads the point standings with one race left before the tour’s chase for the championship begins. Next-up for Brock is a trip to Baer Field on Saturday, July 28th for the last regular season ARCA/CRA Super Series race.